Elderberry is one of those native bushes that you grow up with, but never seem to give it much thought. Elderberries always seem to be there; surviving, producing, and spreading with little or no help from us. If you are wild-crafting elderberries, look for the distinctive and easy to spot white flower clusters during the latter part of June. The flowers provide forage for insects when the spring dandelion and fruit tree bloom is over and before many of the summer flowers have started to bloom. The berries provide lots of food for the birds (and us) during the last part of August to the first part of September. Both deer and goats will eat elderberry plants, but there is usually something tastier than elderberry plants. In the winter the deer consider almost any tree sapling better eating than elderberry stems. Elderberries are carefree and quite hardy. My guess is that elderberries (S. canadensis [now S. niger ssp canadensis - Ed. 2012]) are hardy well into zone 4. I have never seen an elderberry plant winter-kill around here (zone 5B). Elderberries are easy to transplant in early spring: cut the stems back to leave 3-4 leaf buds and dig up slightly more root than stem. Don¹t take all of the plant. Leave plenty to grow and replace what you have removed. Be sure to replace removed soil with good soil/compost. If transplanted to a moist, well drained, sunny spot, your elderberry will thrive on nearly any soil. 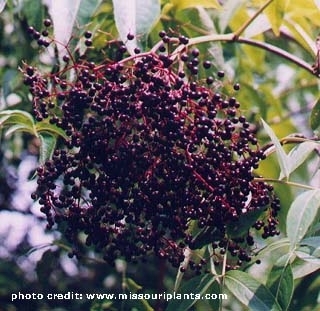 Elderberry is native to eastern North America. Range is from Nova Scotia to Florida west to Manitoba, Kansas, and Texas. Elderberry is a deciduous bush with fairly fragile and short lived stems. The stem is pithy and fairly weak, so care should be exercised when gathering berries or flowers. Although the stems often die within ten years, they are usually replaced by new stems coming up from the roots (stolons). I know elderberry bushes that have been growing in the same place (more or less) for over forty years. When elderberries do die out, it is most often from encroaching forest shading them out, much like stag horn sumac. Elderberries seem to be free of pests, although we have had elderberry stems die back from something causing root or stem damage. All of the leaves wilted with the nearly ripe berries hanging in desiccated bundles. I thought one bush was dead, but it did come up from the roots the following spring. I never did figure out what was causing the problem (moles? stem borer?). That was several years ago and the problem has not returned. Pollination: I have seen a number of different insects on the elder flower clusters: honey bees, small yellow jackets, and several smaller flies, bees, and wasps that I can't identify. Elderberries seem to prefer moist well drained soil, in full sun to partial shade. My dad was a water witch and said, "water is within ten feet of the surface where elderberries grow". The elderberries that we having growing/thriving on our property support that assertion. We live on a glacial-till valley floor, and our water table varies from five feet (wet spring) to eleven feet (drought) from the surface, as measured in our well. However, I have often seen elderberries grow along the eave line of a barn, house, corncrib, or other structure where I know the water table to be significantly deeper than ten feet. I suspect that routine mowing around the structure protects the elderberries from encroaching forest, and that the roof concentrates the rain just enough during the dry parts of the year for the elderberries to thrive. I have also seen elderberries grow where they are occasionally flooded (drainage ditch banks), but I have never seen them where there is standing water for a significant part of the year, nor have I seen them in very dry places. The elderberries that are in full sun (in the herb garden) start to ripen their berries about a week earlier than those in partial shade, and seem to produce slightly more berries than those in partial shade. The elderberries in partial shade ripen over a 4-5 week period, whereas, the elderberries in the full sun ripen over a two week period, starting sometime in August, depending upon the weather in any given year. We are about 1000 feet above sea level, friends who live about 2500 feet above sea level have their elderberries ripen about two weeks after we do, and their Basswood (linden tree) flowers are also ready to pick about two weeks after our Basswood. In the atmosphere there is roughly a three and a half degrees drop in temperature per 1000 foot increase in elevation. I don't think there is that much variation in temperature on the ground at different altitudes, but altitude does make a difference. Elderberries are easy to gather, as long as you beat the birds to the berries. The birds like elderberries almost as much as they like mulberries. I am thinking here of the black or silkworm mulbery (Morus alba) which the birds seem to like better than our native red mulburry (Morus rubra). The stem of the elderberry holding the terminal cluster of berries breaks off easily at the last leaf node. The berries are good eating right off of the bush. I use my teeth to pull the berries from the cluster. I have never had any problems eating ripe elderberries raw, in spite of reading that the uncooked berries are poisonous. If your mouth isn't stained when you come in from picking elderberries, you're not doing it right! But my favorite way to eat elderberries is in a pie. Elderberry pie is well worth the minor effort to stem the berries. Filling for a nine inch pie takes about three plus cups of stemmed elderberries, one and one- half cups of sugar, and one-half cup of flour. Some people don¹t like elderberries, because of the seeds, and I am told that the seeds can also cause a problem for people with diverticulitis. The juice can be separated from the seeds by straining the stemmed, mashed, and cooked berries (a potato masher works well) through a jelly bag. An old but whole pillow case works well as a jelly bag, but it will be permanently stained by the elderberries. This method works well but is a bit messy. A few years ago we went "high tech" and bought a "mea mia" home steam extractor and now we separate the juice from the seeds by steam extraction. The nice thing about steam extraction is that you don't have to de-stem the berries. Once you have the juice, it is a simple matter to make jelly or syrup. Elderberry jelly is just four cups of juice, one and one-half cups of sugar, two tablespoons of lemon juice, and one package of sugar-less pectin, boil for one minute, and put in jars. Or, you can double the sugar, eliminate the pectin , and boil for 40 minutes, till the syrup sets. Syrup is basically just jelly without the pectin. Elderberry jelly on toast, or syrup on pancakes or ice cream is a real taste treat. My dad made elderberry wine which the adults in the family seemed to enjoy. He also made an elderberry cordial that I enjoyed as a boy, but I never got more than a taste. As I remember the cordial was just a very sweet elderberry wine, and sometimes dad mixed in some choke cherries too. Grandmother Glenn said that you can make wine from the elderberry flowers. I have no personal experience with elderflower wine, but I suspect it would be made much as you would make dandelion wine. The Herb Society of American's Encylopedia of Herbs (1995) says: "Historically all parts of S. niger are used medicinally, but modern usage favors the flowers. They [the flowers] contain a plant acid that is apparently anti-inflammatory, flavonoids (including those as found in Ruta graveolens [Rue] . . . ), and fixed oil, the leaves contain toxic cyanogenic glycosides (as found in Prunus species . . .)" (page 347). Peterson¹s Field Guide to Trees and Shrubs (1986) says: "All parts of the plant [S. canadensis] reported to yield hydrocyanic acid. Regardless, fruits are used in making jam, jelly, wine, pies." (page 48) After reading that, it makes you think: "Toxic cyanogenic glycosides! Hydrocyanic acid! who would eat elderberries?" OK, I believe them, but everyone in my family has been eating elderberries, in one form or another, for as long as I can remember. My mother talked about picking and eating elderberries (raw, pies, juice, jelly, and wine) and elderberry flowers (battered and fried or dried for tea) with her grandmother. As a boy I remember being out and about and being hungry (a common memory). I ate a lot of unripe elderberries and got stomach cramps. I never considered that the unripe berries were poisonous, I just figured that they were not ripe and I was stupid to eat them green. My guess is that leaves, bark, and green berries are probably toxic to some extent. But, I suspect that a poisonous ripe elder BERRY is from a species other than S. canadensis or S. niger. If elderberry (S. canandesis) jelly, syrup, wine, or pie is poison, it sure is a poison that I enjoy! I have eaten a lot of elderberries in my life, but I have always thought of elderberries as food not medicine. 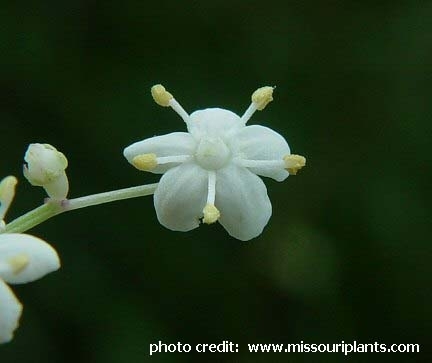 However, both American elderberry (S. canandesis) and European elderberry (S. niger) have a long history of medicinal use. A number of herbal books discuss using elderflower tea or elderberry extracts [juice/syrup] as an herbal medicine for ailments like sore throats, flu, and colds. Other herbal books state that the leaves and bark of elderberry are laxative, and that elderflower tea induces "the sweats". Cold elderflower tea is also recommended to soothe eye and skin ailments. Our family has followed our grandmother Glenn's advice and we do use elderberry flower tea for sore throats, colds, flue and the like. She also said elderflower tea was good for menstrual cramps, but I can't speak to that. We gather the elderberry flowers the last part of June (June 22 and 26 in 2005), and dry them on screens in the hay loft in the barn. The tea has good if somewhat bitter taste, the children prefer a bit of honey in the tea. The "sweats" from elderflower tea is a very mild phenomena. But, we are convinced of the efficacy of the tea, and we drink the tea any time we start to get a throat "tingle". The earlier we use the tea when a sore throat flu or cold is starting the better the tea seems to work. My guess is that elderberries and elderflowers have some constituant that has anti-viral properties, and/or stimulates the immune system in some fashion. The elderberry is not on any endangered or threatened lists, that I am aware of. However, that does not mean that ethical behavior is suspended when gathering elderberries or wild crafting other parts of the elderberry plant. Don¹t forget to leave plenty of flowers for the insects and berries for the birds. After all, insects and birds have had a symbiotic relationship with elderberries at least as long as we have. "Sambucus L. Elder, Elderberry. Caprifoliaceae. About 20 species of shrubs or small trees with pithy stems, rarely herbs, of wide distribution in temperate and subtropical regions; leaves opposite, odd-pinnate [compound]; leaflets toothed; flower in compound terminal cymes, small white, usually 5-merious, corolla rotate, ovary inferior, 3-5 celled; fruit a small berry like drupe, with 3-5 nutlets. The species in Sambucus are difficult to delimit, and there is no agreement among various treatments in regional floras. "Elders are ornamental when planted in mass; some species are also grown for the edible fruit, although in other species the fruit is poisonous. [Too bad that L. H. Bailey didn¹t tell us which species are poisonous.] Most of the elders are hardy [in] north[ern portions of North America] and thrive in rich, rather moist soil. Propagated by seeds, cuttings, and some kinds by suckers. "S. canadensis L. American Elder, Sweet Elder To 8 feet [12 feet in a good location], stoloniferous, pith white; leaflets usually 7, elliptical or lanceolate, to 6 inches long; flowers white in umbrel-like cymes to 10 inches across [fairly common in robust bushes]; fruit purple-black, edible [very], early summer. Nova Scotia to Florida and Texas. Zone 4. Fruit is used to make wines, sauces, jellies, and pies. Cultivars include: 'Acutiloba', leaves much-dissected; 'Aurea', leaves golden-yellow, fruit red; 'Chlorocarpa', fruit greenish; 'Dissecta', listed; 'Laciniata', listed; 'Maxima', larger form, cymes to 15 inches across. Pomological cultivars with large clusters and berries include: 'Adams No. 1', 'Ezyoff', 'Johns', 'Kent', 'Nova', 'Scotia', 'York'. Varity: 'submolis Rehd' Leaflets, grayish-green, soft pubescent beneath. Illinois to Iowa to Oklahoma and Texas." Family: Caprifoliaceae Honeysuckle family, about 400-450 species [L.H. Bailey] Opposite leaves, pinnately compound or simple. Flowers: few in cymes or many in rounded or flat clusters. Caprifoliaceae includes 13 genera of mostly temperate plants. Many of the plants are ornamental. Genera: Abelia; Alseuosmia; Diervilla, (bush honeysuckle, 3 species native to NE Amer., deciduous shrubs); Dipelta, (deciduous shrub, 4 species); Kolkwitzia, (deciduous shrub, 1 species - beauty bush); Leycesteria; Linnaea; Lonicera, (honeysuckle, 15 species of deciduous/evergreen erect/climbing shrubs); Sambucus, (elder, 20 species, small trees, pithy stems); Symphoricarpos; Triosteum, (Horse Gentain, wild coffee, 6 species, 2 native to N America); Viburnum, (arrow wood, cranberry), 225 species, deciduous shrubs); Weigela, (floribunda, florida, praecox, 12 species). Genus: Sambucus : Elder Genus contains about 20 species. Elders are small trees and shrubs with pithy stems, odd-pinnately compound opposite leaves, Leaflets toothed and two to six inches, Flowers: many in rounded or flat clusters, fruit is a small, 4mm (5/16 inch) in diameter, drupe in clusters. Species: canadensis L. (Synonyms: elderberry, Canadian elderberry, sweet elderberry) Native in Eastern North America, bush with loose clusters of stems, typically grows to ten feet. Stem pith and flowers are white, leaves typiclly have 7 leaflets. Fruit is edible. 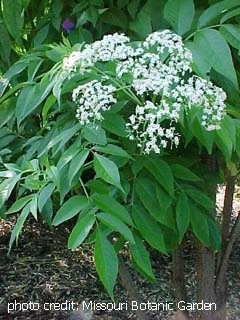 ALSO:S. niger L. (black elderberry, European elderberry, stinking elder) Native in Europe, small tree grows to 30 feet. Stem pith and flowers are yellowish, leaves typiclly have 5 leaflets. Fruit is edible. Sambucus niger is the elder that many herbal books discuss. Historical refrences to elderberry are always refering to S. niger, except for native American historical refrence to uses of S. canadinsis. Note 1: Classification from Kindom through order follows "A Coevolutionary Structure for the Plant Kindom", by Brentmar and Kapuler, 1988 (after Dahlgren,Rolf). Classification from family through species follows "Hortis Third", by L.H. Bailey, et al., 1976.